Planning kiddo's birthday party can be fun and stressful at the same time, especially for parents who try to outdo each other with bigger and better events. That's where children's party planners like Courtney Price come in. Price got the idea to start the business when she was on maternity leave from her HR job in 2009. "I was already thinking about a total change of pace. I've always been creative and I enjoy children," she said. So she first tried it on a part-time basis. "If I failed, at least I knew I took a stab at it," she said. Demand quickly took off. Eventually, she quit her corporate job and started Glamour Avenue Parties in 2010. 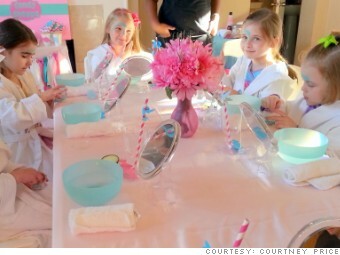 Price takes her business on the road, going to clients' homes to set up unique birthday party themes such as spa, rock star or tea parties. She can also customize the theme if parents have their own unique ideas. Based in Spring, Texas, Price typically is booked Friday through Sunday. Her rates range from $275 to about $600 per event. For that, "I provide chairs, decorations, plates," she said. "Basically everything you will need for the party."